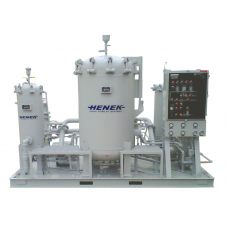 HENEK Fluid Purity Systems premier series of Turbine Oil Conditioners are designed and built to exceed your expectations in providing turbine oil cleanliness. With flow rates from 2 to 140 GPM, and variable flow rate models available we can manufacture a system to meet your specific needs. The inlet pump draws oil into the system. The oil then enters a pre-filter vessel where solids are removed down to ᵝ6=1000 per ISO 16889. The oil then enters our Two-Stage Filter Separator Vessel and then flows through the coalescer element assembly where the water is coalesced as the oil passes. Solid contaminants are further retained by the filter medium and the water settles to the bottom of the filter above the deck plate. The oil then passes through the separator element where any remaining water is removed and water contamination is drained either manually or automatically. The dry oil exits the filter separator and passes through a post-filter vessel for final particulate removal. The HENEK Turbine Oil Conditioners are designed to provide complete turn over once every two hours, equal to a 50% turnover rate.